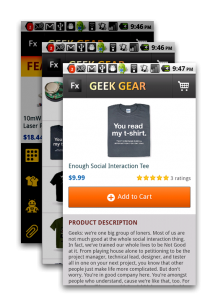 much ado about something » Get started developing mobile apps with our new preview releases of Flex and Flash Builder! 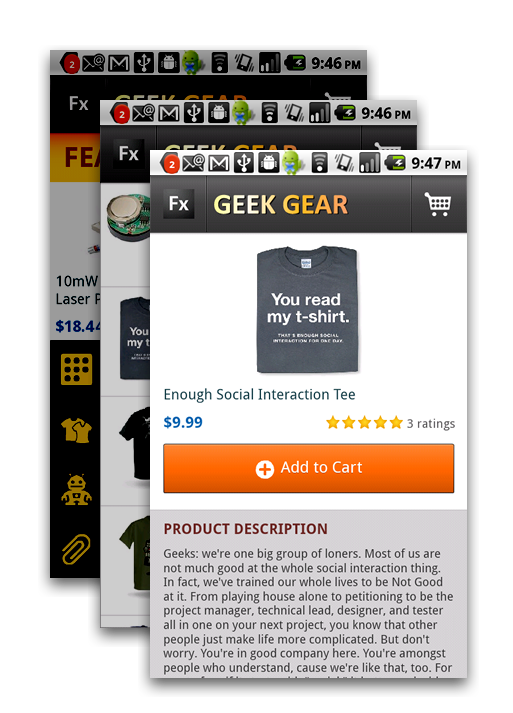 Get started developing mobile apps with our new preview releases of Flex and Flash Builder! It’s Day 1 of Adobe MAX 2010, and in conjunction with the start of the conference we’ve just announced the public preview releases of Flash Builder “Burrito”, Flex SDK “Hero”, and Flash Catalyst “Panini”. We’ve talked a little bit before about the new mobile features in Flex “Hero”, but now you can experience for yourself not just the new framework features, but also the all-new mobile development workflow we’ve added to Flash Builder. One of the great things about mobile development in Flex and Flash Builder is actually that it’s not all that different from developing desktop or web applications. When building mobile phone or tablet applications in Flex, you use the same Spark components you’re already familiar with; we’ve added mobile skins and touch interaction to the existing core components like Button and List. On top of that, you can take advantage of new components we’ve specifically created to make it easier to build mobile applications with the standard view-to-view navigation people are used to on touchscreen smartphones. Similarly, building a mobile application with Flash Builder uses exactly the same workflow as building a desktop application. You create a mobile Flex project using the “New Flex Mobile Project” wizard, but once you’ve done that, you’re writing code and using design view the same way you would for any other Flex application. 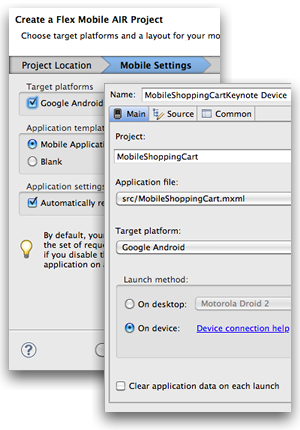 In a mobile project, you can choose to run/debug either on the desktop or on an actual attached physical device. If your device is on your WiFi network, you can even use all the standard Flash Builder debugging features on the device, like setting breakpoints, stepping through code, inspecting variables, and moving around the call stack. When you’re done, you use Export Release Build to build an AIR application package that’s ready for deployment to devices. Unlike on the desktop, mobile AIR apps are packaged and installed the same way as native apps, so you can take the output of Export Release Build and send it directly to an app store, like the Android Market. To end users, AIR apps look just like any other application in the app store; the only difference is that the first time a user runs an AIR app, s/he is prompted to download the AIR runtime. After that, AIR applications install and run just like native apps. We recently released AIR 2.5 for Android, and as we build and optimize AIR for other platforms, we’ll be bringing Flex and Flash Builder to those devices as well; BlackBerry Tablet OS and Apple iOS support are on the way, with even more platforms to come in the future. Of course, since this is still an early preview, there are bugs, performance issues, and missing features left to implement. But as you can see from the sample applications, you can do a lot with what’s there already. Let us know what you think–good or bad–in the Flash Builder forum. I’m really excited that we’re finally getting to release this stuff to the general public. I know that the first time I got a Flex application running on an actual phone and hit a breakpoint on the device, it felt like a revelation. I hope it feels that way to you too!